Over the last 18 months, Sharyn Yuloff and I have been on a long, interesting, fun, and enlightening journey to complete the changeover on our business which began 7 years ago. This journey has taken us along many different positive paths, including joining two Mastermind groups, increasing the number of public speaking engagements we have accepted, and connecting with some incredible human beings. One of those very special people is Larry Broughton, president of Broughton Properties, a collection of boutique hotels and one of the finest gentlemen we have had the pleasure to meet. He is an award-winning entrepreneur & CEO; optimist; best-selling author; keynote speaker; hotelier; and former U.S. Army Green Beret committed to helping visionaries, leaders and high-achievers step into the leadership gap. Larry has begun a website for leaders called Yoogozi.com. He has populated the site with the sorts of information that leaders need to improve themselves and share that improvement with others. 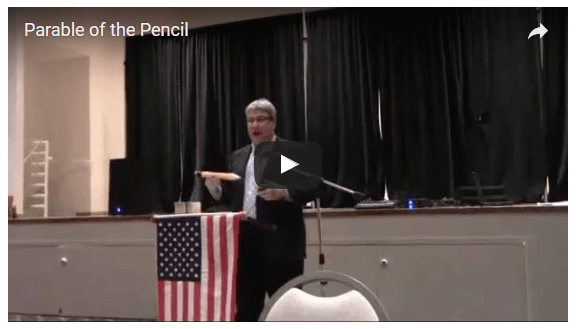 Along those lines, I have heard Larry tell the story of the Parable of the Pencil. It made such a significant impression upon me, that I have begun doing what Larry says to do – share it with others. Above is the video of MY first public sharing of the Parable of the Pencil – and I wanted to post it here as a benchmark – I will post it again in about a year and see how much I can improve. Below is the written version of the Parable – taken from www.Yoogozi.com. I strongly suggest you head over to that site and absorb the positivity. What can we as leaders learn? What can we high achievers learn from the parable of the pencil? First, let’s be humble, just like the pencil you’ve got to carefully be guided and molded by people who are bolder and brighter than you are. This is why we use mentors and boards of advisors and we surround ourselves with people who just care about us. Number two, stay sharp. Feedback is going to be painful from time to time but without it we just become dull so take time to sharpen your skills by actively seeking out feedback and encouragement but also read as much as you can. Go to leadership summits, go to seminars, watch other leaders in action and then just get leadership experience. Number three, it’s okay to make mistakes. In the process of becoming a great leader, we going to make mistakes so embrace these mistakes as opportunities to learn. Learn, erase and become better. Number four, just be yourself. Just like pencils, we all come in different shapes and sizes and different colors but really it’s what’s on the inside that’s really the most important. You can have an amazing impact on the world if you just be yourself and keep striving towards your purpose. Finally, don’t give up. There are going to be times when you’re going to wonder whether it’s all worth it but people are depending on us. Keep on going, keep on moving on, hold onto your vision even when your vision is diminished or if you feel like it’s fading, just keep going on because people are counting on us to get them where we’re going. Which of these five lessons the Parable of the Pencil resonates with you the most? Give me a call or connect with me on facebook or fill in the attached form and let's talk.